PHNOM PENH, 31 January 2013 (The Cambodia Herald) - Lawmakers from the opposition Sam Rainsy Party will attend the funeral procession for the late King Father Norodom Sihanouk, president Kong Korm (pictured) said Thursday. "We have the will to attend the ceremony," he told Cambodia Express News, an affiliate of The Cambodia Herald. "I'll attend the procession for the King Father in my capacity as senator," he said, referring to the procession through the streets of Phnom Penh on Friday. Sihanouk died of a heart attack in Beijing on October 15 at the age of 89. Funeral ceremonies will last until Monday when the body is cremated. PHNOM PENH, 31 January 2013 (The Cambodia Herald) - The Ministry of Foreign Affairs and International Cooperation said that Indian, Malaysian and Canadian dignitaries would attend the royal funeral starting Friday. The ministry said earlier that the prime ministers of France, Laos, Thailand and Vietnam were scheduled to attend the ceremony in addition to other dignitaries from Australia, Brunei, China, Indonesia, Japan, South Korea, Myanmar, the Philippines and Singapore. In a statement Thursday, the ministry said Indian will be represented by Human Resource Development Minister Mangapati Pallam Rau. Malaysia will be represented by Koh Tsu Koon, minister in the Prime Minister’s Department, and Canada by Deepak Obhrai, parliamentary secretary to the Minister of Foreign Affairs. 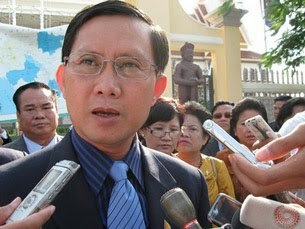 PHNOM PENH, 31 January 2013 (The Cambodia Herald) - The National Rescue Party will hold its first congress in early April, Human Rights Party lawmaker Yem Punharith says. Speaking on Tuesday, he said exiled opposition leader Sam Rainsy would be appointed as party president while Human Rights Party Kem Sokha would be vice president. Kem Sokha is expected to resign from the Human Rights Party at an extraordinary congress on April 6 and stand as National Rescue Party vice president a day later. A new president has not yet been decided. 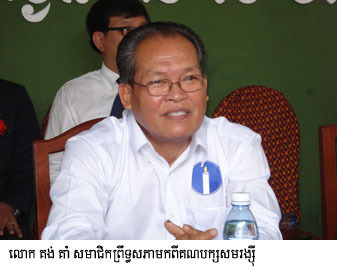 "Kem Sokha will just resign from the party but he will not resign from his post as lawmaker," Yem Punharith said. The ongoing military exercises near the Thai-Cambodian borders give the impression that tensions over the long-standing Preah Vihear temple (known in Thai as Wat Khao Phra Viharn) dispute are escalating. 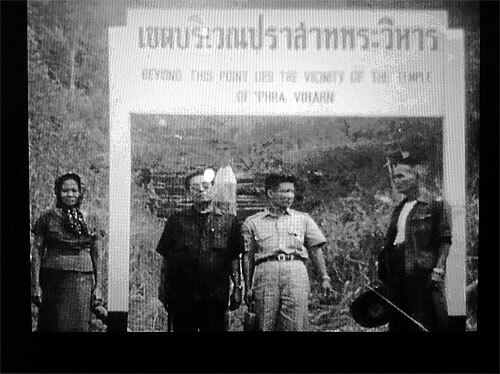 A file photo taken in 1962 shows a group of senior Thai officials posing in front of a sign stating ‘Beyond this point lies the vicinity of Wat Khao Phra Viharn’, next to the temple’s stairs. This is because this year's drills, while being an annual affair, are noticeably comprehensive involving troops from several units, from infantry, cavalry, artillery and special task forces as well as those from an engineer tank battalion. No less important are the drill sites, covering the border areas from Surin, Ubon Ratchathani and Si Sa Ket _ which are under the jurisdiction of the Suranaree Task Force _ and the stretch behind the disputed 4.6 sq km area around the Preah Vihear ruins. At the same time, the navy's Combined Arms Live Fire Exercise (Calfex), which is to take place tomorrow, will be presided over by senior figures like Supreme Commander Tanasak Patimapragorn and navy commander Admiral Surasak Runroengrom. There are also reports of Cambodian military exercises on the other side of the border, next to the temple. Some have interpreted the military drills, which are to be completed in March, as a signal to the International Court of Justice (ICJ), which will deliver a ruling that will affect the people of both Cambodia and Thailand. Apart from the show of military prowess, it happens that army chief Prayuth Chan-ocha has adopted a more aggressive tone, with his "ready-to- fight" message when asked what the Thai army will do if the ICJ gives an unfavourable ruling leading to the loss of territory. Thais should stand united in the fight to preserve the country's territorial sovereignty, Nipat Thonglek, deputy permanent secretary for defence says. The upcoming International Court of Justice (ICJ) hearing on the Preah Vihear temple on the border with Cambodia should be a win-win for both countries so they can live peacefully together, he said yesterday. "Even though the court has ruled the temple belongs to Cambodia, the land surrounding the temple is considered Thailand's property," he said. Gen Nipat was speaking at a Defence Ministry briefing on the temple row. The ministry yesterday held its first session to explain the dispute to its top brass and journalists. Gen Nipat said the government would compile a submission to the court to defend Thailand's assertion of ownership to land surrounding the temple. A further oral explanation in the ICJ on April 15-19 would be the last chance for Thailand to protect its sovereignty to the land. Cambodia has asked the ICJ to interpret its 1962 ruling, which granted Cambodia ownership of the temple but which did not determine ownership of the land surrounding it. South Korea replaced the UK as the largest investor in Cambodia last year, with about $287 million injected, 12.5 per cent of the total foreign direct investment, according to data from the Council for the Development of Cambodia (CDC). The three main Asian economic powers, China, Japan and Korea, were the largest investors in Cambodia during the country’s chairmanship of ASEAN, with total investment about $762.6 million, the CDC said yesterday. This represents 33 per cent of the total $2.28 billion of foreign investment in the Kingdom last year. Korea was followed by the world’s second-largest economy, China, who invested $263.6 million, while Japan was third, with a total investment of about $212.3 million. While China and Korea are usually top investors in Cambodia, Dr Vong Sam Ang, general manager of Soma Consulting Services, welcomed the jump in Japan’s position as positive for the Kingdom’s image on Japan’s investment map. According to the data, South Korea focused on the manufacturing of garment, toys and electronic parts, as well as on tapioca processing and a bio-ethanol plant. BANGKOK, Jan 29 – Thailand's Foreign Ministry will issue a question-and-answer handbook to create public understanding of the Phra Viharn (Prear Vihear) temple dispute between Thailand and Cambodia, a ministry spokesman said. Nattawut Pothisaro, spokesman of the Thai legal team defending the dispute, said the handbook, titled “50 Years, 50 Points, Q&A on Phra Viharn Temple,” will be distributed to government agencies and schools and universities next week while the general public can view or download the handbook on the Foreign Ministry’s website: www.mfa.go.th/phraviharn from today. According to a recent survey by ABAC Poll, 82.5 per cent of people said the government has failed to give clear information on the Phra Viharn legal conflict which is pending a ruling by the International Court of Justice. Mr Nattawut said the poll results prompted the Foreign Ministry to provide more information on the complicated issue which has engaged Thailand and Cambodia for years. The handbook consists of 50 Q&A subjects to remove public doubts regarding the Phra Viharn dispute, he said, adding that more publicity in the form of cartoons and documentaries will also be produced. Mr Nattawut said an official team will meet soon with community leaders and government officials in some provinces along the Thai-Cambodian border to disseminate the information on the temple dispute. Cambodia has always been known for its clothing industry, but it's now moving into higher-value products such as electronics and car parts. The country's growing economy is attracting more multi-national companies and businesses keen to reach other markets across Southeast Asia. As a result, air cargo shipments in and out of Phnom Penh airport have jumped significantly. VietNamNet Bridge - Just after the flood season, hundreds of fishermen in the southern province of An Giang go to Cambodia to catch fish, with the output of thousands of tons. When the flood recedes, fish go upstream. Therefore, at the end of the flood season in the Mekong Delta, fishermen bring their fishing equipment to Cambodia to net fish. Although they have to pay high rents for fishing areas (called block), they can recover capital and earn profit if they catch about 200-300 tons of white fish. Mr. Nguyen Van Tung, a fisherman in Khanh An commune, said that in recent years, the fish output in Cambodian has decreased but it is still quite abundant. The reason for that is because the places where Vietnamese fishermen rent water locations are barely inhabited. Some blocks are located along the tributaries of the Mekong River but there are blocks are between submerged moors. However, more importantly, the local government has performed the protection of aquatic resources well. They have clear regulations on the species of fish for catching, at a specific time in the year. If they find fishermen using nets with dense meshes or electric tools to catch fish, the violators will be heavily penalized. They will have to sell cattle and rice fields to pay a fine, otherwise they will be imprisoned. 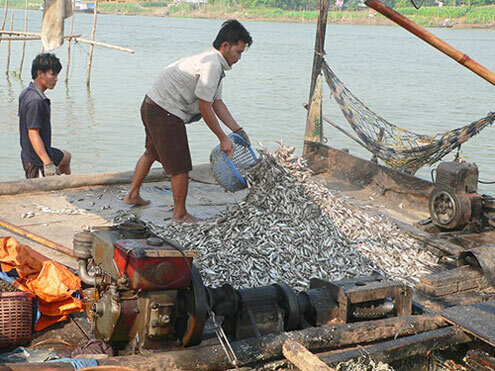 According to Tung, every three years, the Ministry of Fisheries of Cambodia holds bidding for exploiting fishing blocks with the fishermen in the two provinces of Takeo and Kandal. In particular, Kandal has 11 blocks with a total length of 100 km. The Vietnamese fishermen usually buy the right to exploit these blocks from the local people, at the price of 10 times higher, equivalent to VND2.4 to VND4 billion ($110,000-$200,000) a block. Those who do not have abundant capital can buy small lots of 20-30 hectares but the price is not less than VND200 million ($10,000). These are the men without a voice: Chan Sovann, Touch Rin, Phoin Sroeurn. Few will recognise those names, because few will remember that four people are in prison for their involvement in the so-called Kratie secessionist movement. In October, independent radio station owner Mam Sonando was sentenced to 20 years for a crime for which no credible evidence has been produced. The 71-year-old broadcaster, a perennial thorn in the government’s side who had twice before been arrested on charges widely believed to have been trumped up, has been a prisoner of conscience. Sonando has the rare power to reach millions of Cambodians. He is a man who could easily use his influence to pursue a political career, a man who dared to share his criticisms of the government with the nation’s vulnerable, powerful electorate. In other words, Sonando is a man who would have been a prime target to shut down. Sovann, Rin and Sroeurn are nobodies. But they are serving three years, five years and 10 months, respectively. Five neighbours also arrested after the raid were given suspended sentences in exchange for testimony implicating others. Rin’s wife says he was offered a chance to do the same but “would be happier staying in prison for his whole life than accuse someone he doesn’t know”. Swept along by forces far outside their purview, the three appear to have been unwitting scapegoats. It is still unclear why they were chosen. Unlike Bun Ratha — whom the government labelled a “ringleader” — the three made no effort to educate their neighbours about the land law. PHNOM PENH - Cambodia's export business is in the process of changing due to shifts in manufacturing in Asia. A business publication in the country has reported unexpected growth in the "machinery and transport equipment" sector and speculated it was as "probably bicycles". But when Cambodia jumped into the top 10 exporters of bicycles to the European Union in 2012, it prompted the European Bicycle Manufacturers' Association (EBMA) to investigate. In 2011, 366,000 bikes were exported from Cambodia to the EU but "in the first half of 2012 the country managed to almost triple its bike export to the EU. Cambodia's exports totaled close to 520,000 units in the first six months of 2012 compared to 140,000 in the same period of 2011," according to Bikeeu.com. The EBMA discovered that bicycle companies had moved their production to Cambodia from Thailand and China, citing increased expenses. The move is estimated to save 14% on taxes. A favorable scheme is in place for least developed countries (LDCs) under the Generalized Scheme of Preferences known as the Everything But Arms (EBA) agreement. The EBA allows countries ranked among the 48 LDCs to export products duty-free to the EU, except arms and ammunition. Introduced at the beginning of 2011, it ushered in a surge of 53% in export growth to European countries that year, making the EU Cambodia's second-largest export partner after the US, according to local business reports. Increasing expenses in China and Thailand have been attributed in part to rising wages. The minimum wage in Thailand was recently raised to 300 baht per day (US$10) and salaries in China in this business have risen to US$400 per month. By contrast, minimum wages in Cambodia are set at just $61 per month. Eight fishermen returned to Cambodia from Indonesia on Wednesday after nearly five years of forced labour on a Thai fishing boat. Leaving at different times with the aid of job brokers − some in 2008, others a year later − the men wound up on the same boat. The labour was gruelling. “I was ordered to work on the boat day and night. No free time at all and no wage to send home. And I did not have enough food. Four years for me was like a hundred years on the boat,” said Va Chantha, 33, who lives in Kampong Thom province. Another fisherman, Im Sokuntea, 38, from Takeo province, said that after his experience he wants to warn Cambodians offered work on fishing boats by brokers to be wary because the job is too perilous. He said the men escaped when the boat docked in Indonesia, and, with the help of the Cambodian Embassy and local authorities, were repatriated. But not all made the escape. “There are so many Khmer out there shouting for help,” he said. More than a dozen HIV-positive female prisoners have accused Prey Sar prison officials of taking bribes to recommend inmates for royal pardons and reduced sentences, while ignoring the intended recipients of the pardons — parents, the elderly and the chronically ill. The women say officials at Prey Sar — which houses 33 of the 496 prisoners who have received royal pardons or reduced sentences in honour of the King Father’s cremation — included the name of just one inmate who was legitimately sick on a list of pardonees submitted to the Ministry of Interior to be passed on to the Royal Palace. On January 10, the government offered royal pardons to 412 prisoners and sentence reductions to another 84 – supposedly focusing on the elderly, sick and pregnant – as a sign of clemency to coincide with the cremation of King Father Norodom Sihanouk. “We have had good behaviour and hoped to be on the list of pardons during the King Father’s cremation, but we have no name on the list; the names that are on the pardon list are only the rich convicts,” the inmate added, speaking to the Post by phone from Prey Sar. A charismatic Swiss doctor – and cellist – has been a key player in Cambodia’s recovery from years of war and terror, providing much needed health care for mothers and children. Beat Richner, also well known in Switzerland under his nickname of Beatocello, gives a concert every Thursday and Saturday evening in the Kantha Bopha hospital in the northwestern town of Siem Reap, close to the World Heritage site of Angkor Wat. “Health is the main reason why poor families become ruined. By providing completely free care our hospitals enable mothers to stay with their sick child, making it easier for them to get better,” he tells his audience, before picking up his bow and playing “The Song of the Birds”, made famous by Pablo Casals. The first Kantha Bopha hospital was established in Phnom Penh by the former king, Norodom Sihanouk, in 1962 after one of his daughters, Kantha Bopha, died of leukaemia. There are now six Kantha Bopha children’s hospitals and maternity clinics. Richner told swissinfo.ch just why they are so important. Read the full article here. This undated picture shows pro-democracy activist Nguyen Quoc Quan being detained in Ho Chi Minh City, Vietnam. "My husband said that even after months in prison he was better off and freer than the Vietnamese people today," said Ngo. "He said that to do something good you have to be ready to pay a price." (CNN) -- A pro-democracy activist released from a Vietnamese prison was on his way to his California home after nine months in detention, according to his family. 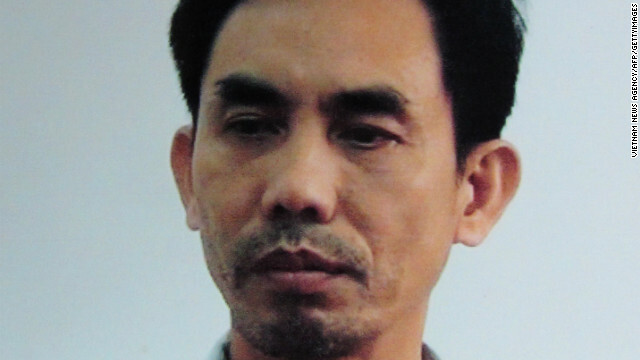 Nguyen Quoc Quan, who holds a U.S. passport, was arrested April 17, 2012, at Ho Chi Min City's Tan Son Nhat International Airport. He was originally charged with terrorism and attempting to overthrow the government, but those charges were later reduced to subversion. His deportation Wednesday was a surprise, following the postponement of his trial last week. State media said that Nguyen, 58, of Elk Grove, California, admitted to taking part in illegal activities and was flown out Vietnam for humanitarian reasons. But the activist's wife said that when he called her before leaving Vietnam, Nguyen denied ever admitting to wrongdoing and said that he was not finished working for democracy there. Nguyen's family and U.S.-based legal counsel welcomed the news. Two police officers were reportedly arrested on Monday for shooting and seriously injuring a 29-year-old man who refused to pay them a bribe at an unofficial roadside check­point in Phnom Penh’s Russei Keo district late Sunday night, the victim and police officials said. Lying in a bed at Calmette Hos­pital—where doctors removed a bullet from the left side of his chest, just above his heart—Dy Vichet recounted the events that led up to him being shot by the angry police officers. Mr. Vichet said he had been transporting a load of chilis from Phnom Penh to Kompong Chhnang prov­ince in his van with his wife and brother, when police stationed along Street 598 in Svay Pak commune stopped the vehicle at about 11:45 p.m. and de­manded a cash bribe to let him continue on his journey. “The police insulted my mother, so I did not give the money to them, and two police officers chased my car and a police officer hit my car’s [wing] mirror with a stone,” Mr. Vichet said from his hospital bed. Mr. Vichet’s wife, Vath Srey­leak, 20, witnessed one of two police officers shoot her husband and told how the two officers then fled on their motorcycles leaving her stricken husband in the road. PHNOM PENH: Cambodia will free more than 400 prisoners, including a Thai convicted of spying, to mark the funeral of its beloved former king, Norodom Sihanouk, an official said on Wednesday. Sihanouk's son Norodom Sihamoni, the current king, has signed a royal decree to pardon 412 prisoners who will be released on Monday, the day of his father's cremation, according to justice ministry spokesman Sam Pracheameanith. "This is a special pardon to mark the royal funeral. It is the royal tradition to pardon prisoners during such a funeral for a king," he told AFP. In a separate decree, Sihamoni cut the sentence of Veera Somkwamkid, a former leader of Thailand's "Yellow Shirt" royalist movement jailed for spying in 2011 in a disputed border area, by six months. But it granted freedom to Veera's secretary Ratree Pipattanapaibul, who was jailed for six years over the same incident, Pracheameanith said, adding she would be released on Friday. 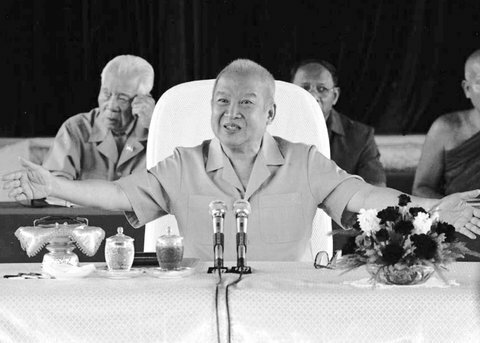 Sihanouk, who abdicated in 2004 after steering Cambodia through six decades marked by independence from France, civil war, the murderous Khmer Rouge regime and finally peace, died of a heart attack in Beijing on October 15. 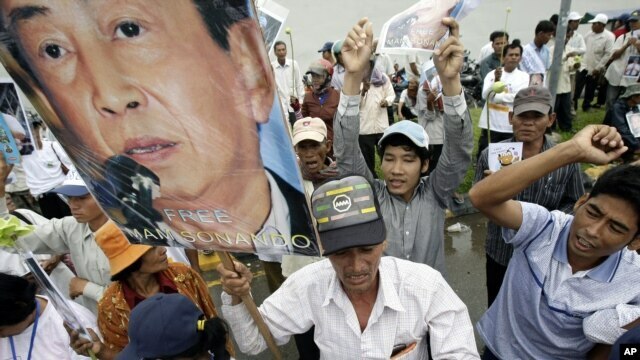 Cambodian supporters of Mam Sonando, one of Cambodia’s most prominent human rights defenders, protest in front of the Phnom Penh Municipal Court, in Phnom Penh, file photo. PHNOM PENH - Reporters Without Borders said Wednesday that the media climate in Cambodia is in critical condition, with the country falling 26 places on the group’s annual press freedom index. Cambodia ranks 143rd out of 179 countries worldwide on the group’s 2013 index, a plummet of its ranking last year and its worst ranking to date. Rights workers have said 2012 was one of the worst years for the country, following the jailing and intimidation of journalists, rights workers and other government critics. Beehive Radio owner Mam Sonando is currently serving a 20-year sentence, on charges that critics say resulted after he criticized Prime Minister Hun Sen. Environmentalist Chut Wutty was killed in April 2012, while escorting journalists to examine illegal logging in Koh Kong province. PHNOM PENH, 30 January 2013 (IRIN) - Nhem Sreyda feels fortunate that she is still able to see after being doused with acid by her ex-husband in 2012. "I am lucky that my body can still work, my eyes can still see," the 32-year-old told IRIN. "It's an indication that this sort of behaviour will not be accepted and perpetrators will be held accountable in accordance with the law," said Ziad Samman, project manager at the Cambodian Acid Survivors Charity (CASC), calling the ruling a "landmark" case. But while activists have lauded the decision, they also feel a more robust implementation of the law is needed. Under the law, people can also be charged with "torture and cruel acts" using acid and sentenced to 10-30 years imprisonment, while "intentional killing" with acid can carry sentences ranging from 15 years to life imprisonment. BBC Worldwide (BBCWW) has launched three channels on Cambodia’s digital pay-TV platform One TV. The pay channels are 24-hour news network BBC World News, which already aired in the country, plus BBC Knowledge and BBC Lifestyle, which make their Cambodian debut on One TV. The BBC’s commercial arm said the three channels will now be available to a potential 1.2 million subscribers of the Cambodian DTT service. The deal comes after BBCWW launched three channels – BBC World News, BBC Entertainment and CBeebies – in Burma in December. Runnin' Wild Kids Shoes on Court St. will accept footwear donations now through mid-March. They say you'll never truly understand a man until you've walked a mile in his shoes. But a trip to his country could also go a long way toward establishing mutual respect. When Runnin' Wild Kids Shoes employee Anna Malafronte, 17, visits Cambodia this spring, she will have played a role in furthering both causes. The Poly Prep student is currently collecting shoe donations at the Cobble Hill store, located at 276 Court St., to bring with her on a goodwill mission to the Southeast Asian country. "A couple of years ago my school Poly Prep raised money to build a sister school in Cambodia," explains Malafronte, who works weekends at Runnin' Wild and was previously a babysitter for owners Anthony and Stacy Fauci. "Due to lack of funds and interest the school has not been able to formulate a trip to visit ours until this year. Now, a group of us will be going to Cambodia over spring break for 10 days." The majority of the class trip will consist of working with their Cambodian peers, but students will also be visiting major cities such as Phnom Penh to experience other aspects of Cambodian culture. Ou Neakiry/Associated Press King Norodom Sihanouk of Cambodia before his weekly audience with people at the royal palace in PhnomPenh in 1994. Between his voluntary abdication in 2004 and his death, the man who secured Cambodia’s independence from France six decades ago kept in touch with his subjects (or the Little People, as he called them) with a steady stream of hand-written notes, annotated press clippings and historical documents, snapshots of beloved dogs, the results of his medical tests, lectures on grammar and meticulously transcribed recipes for crêpes and escargots — all scanned by private secretaries and posted on his Web site, norodomsihanouk.info. In one post, Sihanouk offers his theory for why the French soccer star Zinedine Zidane head-butted the Italian player Marco Materazzi during the 2006 World Cup final: It must have been in response to “words of very grave, extremely grave insult.” [pdf] In another, he professes his support for homosexuals: “I respect and adore them”. Yim Sovann: corruption by officials was costing between $600 million and $800 million in state revenues annually. The National Assembly on Friday passed a law approving the government’s revenue and spending in 2011, drawing criticism from the opposition, which claimed the amount taken in by the government during the period was too low. All 77 CPP lawmakers present voted in favor of the law, while 9 opposition members boycotted the vote, saying they could not give their approval to the budget when so many questions remained over why revenues were not higher. According to a copy of the law, the government recorded more than $2.5 billion in revenue during 2011. That included income of $14.5 million from land concessions, fish­ing lots, mineral concessions and leases. Rights group Licadho said that at the end of 2011, more than 2 million hectares had been award­ed to private companies for agro-industrial purposes alone. The government’s takings also included just $18 million in revenues from the country’s many casinos and $105 million from fuel imports, according to the law. The Ministry of Commerce’s CamCon­trol department in 2011 recorded some $1.38 billion of fuel imports. Yim Sovann, spokesman for the SRP, said the opposition parliamen­tarians had all agreed to abstain from the vote. “We didn’t vote since we don’t sup­port the law because the law proves that the government was not able to collect as much revenue as it should have,” he said. Months of hard work ended for Hout Samnang this week with the modest task of painting sidewalk tiles with a roller, but the 45-year-old walked away from the massive crematorium for King Father Norodom Sihanouk with a strong sense of pride. “We are sorry for the King Father’s death, but working here has made us all very proud,” he told the Post on his final day at the crematorium. Like hundreds of workers from across the country, Samnang has spent the past two months working next to the Royal Palace, toiling away as part of a construction team that has converted Veal Preah Maru park into a stunning, $1.2 million crematorium. “We’ve worked harder than normal, because we’ve also worked at night — from 7pm to 10pm — to complete it on time,” he said, as tourists wandered past, snapping photos of the crematorium and asking whether the painted sidewalk was safe to walk on. For Samnang, the work has been tough and the hours long — he is one of many workers who have slept at the site — but he could not think of a better way to farewell his former monarch, who passed away in China on October 15 at the age of 89. “It has given us a chance to mourn – although we have nothing to return that compares to what [Sihanouk] did for the nation,” he said. Workers like Samnang, employed by Vispan, a company owned by Kong Panya, the daughter of Royal Palace Minister Kong Sam Ol, were paid $7.50 for a day’s work and a three-hour night shift. Prime Minister Hun Sen last month defended the government’s decision to award the crematorium contract to Vispan, saying there was no time for a public bidding process that could have included companies not linked to Sam Ol. In its first year of operation, the Human to Human recruitment agency experienced how challenging the recruitment of factory workers can be. The agency provides a skilled work force, and offers a higher salary and free training – but still needs more workers. Human to Human is a private company that “acts social” by providing training for workers and deals with companies that follow ethical standards. Previously, managing director Chap Chamroeunkunkoet trained garment workers for the International Labour Organisation. The company provides its training sessions, conducted through NGOs, to students and recruited workers for a small charge or for free. “The factories demand high qualifications and much work experience, and it’s hard to find qualified workers. By conducting the training, we attract potential employees and can tell them what they need to know when they are working with us,” Chap said. Eight employees currently work in Human to Human’s small office next to Phnom Penh International Airport. Most clients are garment factories or companies from Japan, Korea, the US, Malaysia, Hong Kong and China. The agency recruited about 1,000 skilled and fewer than 1,000 unskilled workers for its clients during its first year. Through warnings vaguely resembling those issued in times of disaster, the Australian Embassy and the UN have advised their employees to stock up on emergency supplies of food and water ahead of the seven-day mourning period, which begins with a four-day funeral, for King Father Norodom Sihanouk. In an email addressed to staff and their families and obtained by the Post yesterday, the embassy advises people to have sufficient supplies to last “several days” and to be “extra vigilant with security” at home. The UN’s email, also obtained yesterday, tells staff to “make sure that they have everything they need from the supermarket” prior to the weekend, due to the expected closure of many restaurants and shops. “If in trouble, it may take some time for assistance to reach you, if at all!” it reads. Authorities are expecting up to 1.5 million people to attend the funeral, which begins on Friday. Concerns have been raised about what crowd control measures will be in place, in light of the Koh Pich Bridge collapse in 2010, in which 353 people died. Tens of thousands of mourners lined the streets of Phnom Penh in October to see the King Father’s body return from Beijing, where he died at the age of 89. 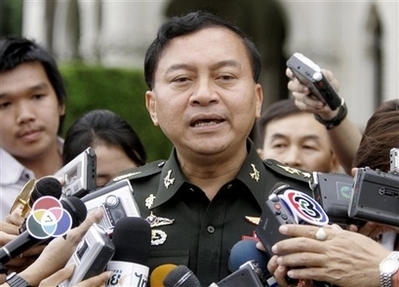 Thaksin’s hidden deals: myth or reality? The ball is definitely in former Thai leader Abhisit Vejjajiva’s court to prove his claim that Thaksin Shinawatra has been the beneficiary of secret deals with Cambodia before he airs accusations linking Cambodia to Thailand’s internal politics. In collaboration with the ultra-nationalist People’s Alliance for Democracy and a group called the Thai Patriots Network, Abhisit, head of the opposition Democrat Party, has been seizing any opportunity, no how matter how small, to accuse Thaksin, in particular, of having received hidden individual-interest deals from Cambodia on the maritime overlapping claims area negotiations under the 2001 Cambodian-Thai memorandum of understanding. Lately, Abhisit and “friends” have even accused Yingluck Shinawatra’s government of selling out disputed territory around the Preah Vihear temple in exchange for individual-interest deals on the overlapping claims area. This is a reference to Cambodia’s request for the International Court of Justice to interpret its June, 1962 judgment because Thailand refused to recognise Cambodian sovereignty over a 4.6-square-kilometre area adjacent to the temple. This was a serious accusation internally for Thailand, but it also involved the reputation of the Royal Government of Cambodia. As a resident of the capital, I write to express my hope that the cremation ceremony planned in Phnom Penh next week for the late King Father will pass without any injury or loss of life among the huge crowds that are expected to congregate in the city. It is rumoured that as many as three million people will travel to Phnom Penh, more than doubling the city’s population. I was in Phnom Penh in 2010, when 353 people lost their lives and hundreds more were injured in what has been described as a stampede on the Koh Pich Bridge. I truly hope the national and municipal authorities have learned some lessons from that tragic event. I have visited the Phnom Penh municipality’s English-language website and, although there is a page dedicated to the event, I have been unable to find any information on crowd-control measures that will be in place over the course of the four-day ceremony. It is of paramount importance to the people of Cambodia that they mourn their beloved King Father. It is more important, still, however, that this ceremony does not lead to further loss of life. 1. The recently passed Law on Financial Management for Year 2013, which amends the relevant provisions on transfer tax introduced by Law on Financial Management for Year 1995, clearly states in Article 12 that any transfer of ownership or possession over any immovable property would be subject to the stamp tax rate of 4% of the immovable property value. The 4% transfer tax was applicable since 1995, but it was not strictly enforced for any undocumented immovable property (that is, any immovable property that is not recorded in land registry but is merely recognized at local authority such as village or commune). But, if any land or immovable property is recorded at land registry as proven by a certificate of ownership, the transfer of that land or immovable property cannot proceed without the tax. Otherwise, it will not be a legitimate transfer. 2. One other Law on Financial Management for Year 2010 introduces another annual tax that must be collected every year at the rate of 0.1% of the taxable value of such land or immovable property. This law is not widely enforced in the meantime, but it may not be so in the future. 3. The Law on Financial Management for Year 1995 also creates and imposes unused land tax, which applies to any land that is not being used. The taxable value is determined by a committee. The current tax rate is 2% of the taxable value per year. I need to challenge your China linkage reporter for 29 January for drawing the headline directly from the Bangkok Post source article, 'China will train the Cambodian army, a move likely to rattle its ASEAN neighbours'. The headline was intended to cater to an internal Thai readership, and is erroneous, particularly when read in the context of these reports. If the Lowy Interpreter intends to continue running China linkage articles, it needs to be more critical of source matter. In this instance, it is understandable that the Thai military would see purchase of the Z-9 helicopters and training of 24 pilots quite differently to other countries in the region. I feel the purchase of Ukrainian tanks and armoured vehicles is of greater significance. Cambodian opposition politicians and media sniffed out that undisclosed purchase after the vehicles arrived across the Sihanoukville docks, hence their ongoing concerns about the Z-9 purchases. My view is that this is less a China story than it is a Cambodia story in their election year. (Singapore)… BBC Worldwide has inked a deal that will see the inaugural launch of three of BBC’s pay TV channels in Cambodia– BBC World News, BBC Knowledge and BBC Lifestyle on Cambodia’s newest digital pay TV platform, One TV. All three channels will officially launch on One TV, the first provider of digital TV services in Cambodia. With this launch, BBC World News, BBC Knowledge and BBC Lifestyle will now be potentially available to the 1.2 million households subscribing to the Cambodian DTT service. CP All, Thailand's largest convenience store chain, said on Wednesday it aimed to open 7-Eleven stores in Myanmar, Laos and Cambodia to tap growing demand in the neighbouring Southest Asian countries. CP All, controlled by Thailand's wealthiest man, Dhanin Chearavanont of unlisted Charoen Pokphand Group, aims to have 7,370 stores at home at the end of 2013 and reach 10,000 stores in 2018, President Piyawat Titasattavorakul told reporters. PHNOM PENH (The Cambodia Herald) - The European Union said it donated €6.9 million to the government Wednesday for 5,000 secondary school scholarships for poor students. Ambassador Jean-François Cautain, head of the EU Delegation to Cambodia, handed the check to Education Minister Im Sethy and Ros Seilava, deputy secretary general at the Ministry of Economy and Finance. Ambassador Jean-Francois Cautain noted the need to increase government resources to the sector, better target interventions towards disadvantaged areas and populations and emphasize quality of education. "I am very glad that discussions about these issues are bringing tangible results" he said. "We know that public finance management systems in Cambodia are far from perfect. An estimated one million people lined the street to witness the return of the body of ex-King Sihanouk on 17 October 2012 and officials estimated the same number will line the streets during his funeral on 4th February. PHNOM PENH: More than one million mourners are expected to line the streets of the Cambodian capital on Friday for a lavish funeral procession for their revered former King Norodom Sihanouk, officials say. The late monarch's body will be transported atop a golden float shaped like a mythological bird from the royal palace -- where he has been lying in state for three months -- to a funeral pyre in a city park. "This is our last homage to say goodbye to the great hero king," Prime Minister Hun Sen said on national radio this week. Sihanouk died of a heart attack aged 89 in Beijing on October 15 last year. 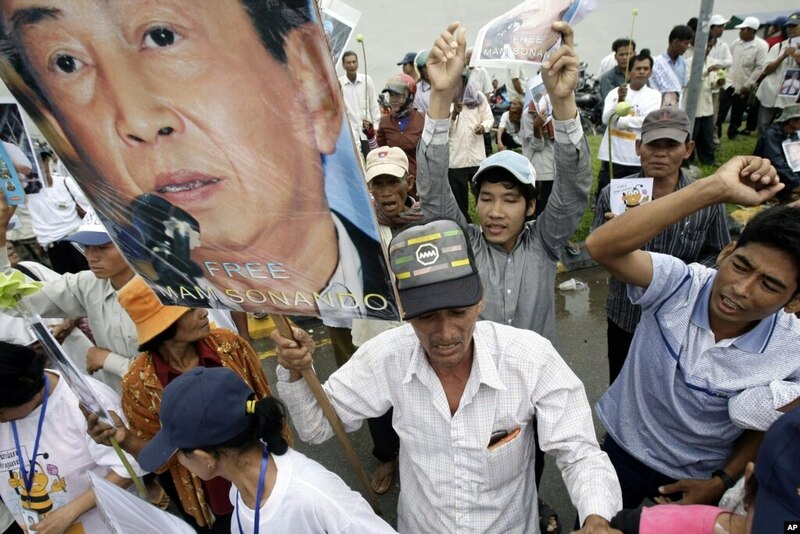 He abdicated in 2004 after steering Cambodia through six decades marked by independence from France, civil war, the murderous Khmer Rouge regime and finally peace. His body will be kept at the cremation site for religious ceremonies until Monday when his wife and son King Norodom Sihamoni are expected to light the pyre. Foreign dignitaries -- including French Prime Minister Jean-Marc Ayrault, Japan's Prince Akishino and a host of Asian leaders or high-ranking officials -- are due to attend the cremation. PHNOM PENH, 30 January 2013 (The Cambodia Herald) - The National Bank of Cambodia has announced the release of a new 1,000-riel note featuring the late King Father Norodom Sihanouk. The announcement by the central bank Tuesday followed a request by Prime Minister Hun Sen after the King Father died in Beijing on October 15. The new note carries a picture of the King Father and an image of the procession which accompanied his body being returned from Beijing to the Royal Palace. The former king is also featured on 2,000-riel, 5,000-riel, 10,000-riel and 50,000-riel banknotes. The body of the King Father is scheduled to be created next Monday after a funeral procession on Friday. PHNOM PENH, Jan. 30 — The National Bank of Cambodia officially issued a new 1,000-riel banknote (in equivalent to 25 U. S. cents) in order to remember and dedicate to late King Father Norodom Sihanouk. A sub-decree on the issuance of the new 1,000-riel currency was signed by Prime Minister Hun Sen on Tuesday. The new note displays a portrait of late King Father Sihanouk on the obverse and a picture of a golden swan-shaped float that transported Sihanouk’s body on the reverse. It main colors are pink and blue. During his life time, Sihanouk’s photos were printed on the current banknotes of 5,000 riels, 10,000 riels, 50,000 riels, and 100,000 riels. Sihanouk died of illness at the age of 90 in Beijing on October 15 last year. His body is now lying in state at the Royal Palace in Phnom Penh for the public to pay tribute. As the finishing touches were being put to the Preah Meru plaza in front of the National Museum where late King Father Norodom Sihanouk will be cremated on February 4, members of the Royal Cambodian Armed Forces (RCAF) Special Force Air­borne 911 Bri­gade were on Fri­day pre­paring to send him off with one of the highest military honors—a deafening 101-gun artillery salute. The ceremony harks back to the days of the imperialist British Empire, when heads of state or the king would receive a 101-gun artillery salute. On February 1, the brigade’s 14 Howitzer artillery guns—using shells donated by Vietnam—will fire a full salute as the King Fa­ther’s body leaves the Royal Pa­lace for the last time. After it has traveled from Wat Phnom back to the stupa at Preah Meru, the battery will fire a second salute. A third will be discharged on Feb­ruary 4, the day the King Father’s body is cremated. “The sound of big guns in the ceremony is necessary,” Defense Minister General Tea Banh said during the practice drill at the brigade’s headquarters in Phnom Penh on Friday, which was also attended by RCAF Commander-in-Chief Pol Saroeun, Defense Min­istry Secretary of State Neang Phat and a Vietnamese major general. “We regard this as a success in preparation, so that we can have good results during the ceremony,” Gen. Banh added. On the day that Cambodia be­gan its tragic and violent de­scent into Year Zero, Al Rockoff was afraid to make it known that he could not speak French. Battle-hardened Khmer Rouge fighters—many of them just teen­agers—were swarming around Phnom Penh. Defeated U.S.-backed Lon Nol soldiers were be­ing stripped of their weapons in the streets and sent in the di­rec­tion of Olympic Stadium, where they were corralled. As the hours passed and the piles of discarded weapons grew on the city’s streets, so too did Mr. Rockoff’s sense of unease—and the fear he would be discovered as an American. Mr. Rockoff survived the first days of the fall of Phnom Penh in April 1975, and was one of a few foreign journalists to stay behind to chronicle the irrevocable de­mise of the city at the hands of its Khmer Rouge captors. On Monday, the bespectacled veteran photographer took to the witness stand at the Khmer Rouge tribunal. Clad in a Hawaiian shirt, Mr. Rockoff’s testimony, which was in­terspersed with the photo­graphs he took at that time, of­fered detailed insights into the madness that unfolded in Phnom Penh 38 years ago.